ESSENTIAL OILS: Purchase dōTERRA Essential Oils & Supplements here. dōTERRA Certified Pure Therapeutic Grade Essential Oils are the purest and most potent and can be used Aromatically, Topically and Internally. 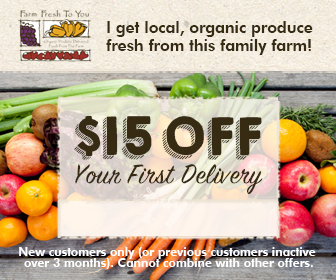 FARM FRESH TO YOU: Organic Farm Box to your Door! With code ELIZ6589 you get $15 off your first order! I love getting my customizable farm box delivered to my door with Farm Fresh to You! They bring the season's best mix of 100% certified-organic produce and hand-crafted farm products It's from local farms and so fresh and flavorful that the food lasts a long time in your fridge. The box is customizable weekly or bi-monthly and vacation holds too! Each delivery comes with delicious recipes, quick tips -- they bring our farmers market booth to you! ERGONOMIC PRODUCTS for a healthier you! 1. ObusForme High Back Neck support - Chair insert with neck pillow. This is a life saver!